Child stardom is nothing new in the entertainment scene and with the advent of social media, we have seen more stars made from the internet than ever before and Lil Tay is one of such. Her uploaded rap videos trademark is cursing, swearing, cash-throwing and use of obscene languages. She became more famous after she dropped a video to diss Rice Gum whom she alleged was bullying her online and her appearance in the brawl viral video of Woah Vicky against Bhad Bhabie aka Daniella Bregeoli. Besides the above mentioned, Lil Tay has courted various controversial headlines which have had both negative and positive outcomes for the child star. Here we will look into who she is and the people in her life as well as the controversies she has generated. She is a rising Instagram star that has gone under several Instagram names. Since her emergence, she as he worked up storms of profane words and exhibited behaviors termed as inappropriate on social media to the point that her Twitter account was suspended. And although there are no available records to ascertain her real age, she has often referred to herself as being under age 10 (9 years old to be precise at the time of writing) in the raps and videos she uploads. She holds the of Canadian nationality while her ethnicity is identified as Asian – Philippine (Filipina). Lil Tay spent her early childhood in Canada before she relocated from Vancouver to Los Angeles in 2018 with her mother and brother. Lil Tray was said to be home schooled after relocating from Canada. Despite the trails of controversies that have followed Lil Tay on social media, it is surprising that she is said to be a straight-A student. The young rapper looks up to Lil Pump whom she got the privilege to meet in April 2018 and aspires to have an opportunity to collaborate with him. She has been seen with Georgia born social media star, Woah Vicky who is also known as Victoria Waldrip. The latter helped the child star gain more popularity after their brawl video, with Daniella Bregoli a.k.a Bhad Bhabie at the Coachella shopping center went viral. 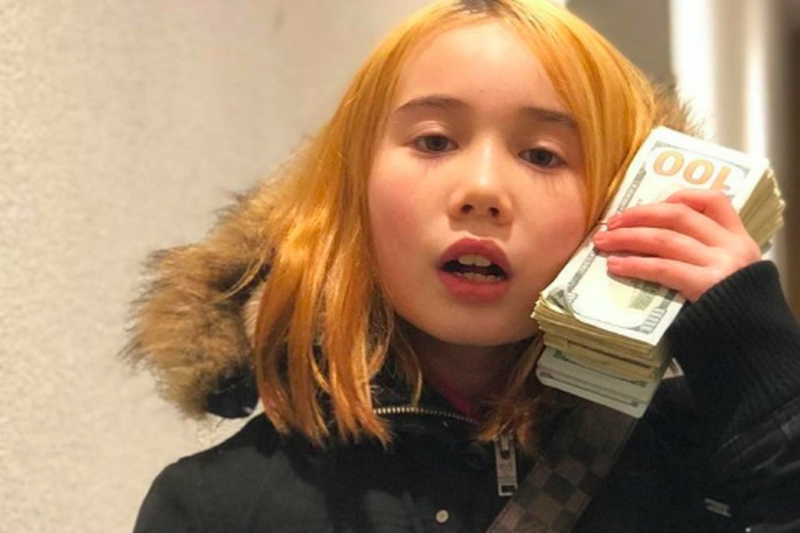 In her short time on social media, Lil Tay has met and featured quite a number of famous social media influencers/stars like Jake Paul who appeared in one of her Instagram video stacking and spreading cash. She dropped her first single in March 2018 and it has generated a lot of views on YouTube. The child rapper is said to be worth about $500,000 which is not a bad start in the entertainment industry. If she keeps getting in the face of viewers as she is doing at the moment, then it is a sum that will surely increase; more especially if the views on her YouTube page and Instagrams keeps growing from the 2 million+ it is now and if her career can be well managed. While not much is known of this child star, the name of her mother is Angela Tian, a realtor (real estate agent) who relocated with her family to Los Angeles. She is largely fingered as the brain behind the scripted acts of Lil Tay. Angela is a realtor and a huge supporter of her daughter career which has led to suggestions that she is using her daughter for financial gains. Angela Tian resigned her appointment in order to help manage her daughter’s budding career. Meanwhile, Lill Tay’s father, Christopher John Hope, has slammed her mother with a court injunction which demands that the child star returns to Canada immediately to stay with him and his live-in lover. There are more speculations that he wants to reap off his daughter’s new found wealth and fame, but he has already stated that he only wants to stop his child from her profane and foul-mouthed use of obscene words, while rebranding her online personality as well as channel all funds generated into a trust fund for her. She has one known elder brother called, Jason Tian, who happens to be 10 years older than her. She has no sister although many people speculated that Miranda Cosgrove could be her elder sister. There were reports that her brother Jason Tian was the one feeding her with lyrics and lines for the raps, and that he is the finger running the Lil Tay Instagram page, an accusation made by Woah Vicky in a YouTube video, where she called out Jason Tian.